Welcome back Peaches. I’d like to break the ice from my long hiatus with an epic experience of watching the humpback whale migration. 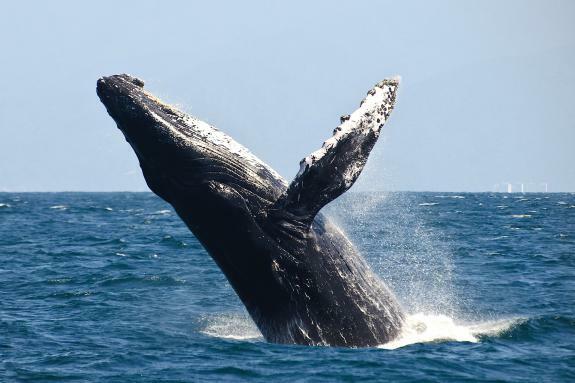 Humpback whales, ocean marine mammal giants usually migrate to the low-lying Coast of Kenya from the Antarctic between July and September to breed. The Coast of Kenya creates the right tropical climate needed by the expectant humpback whales females breeding in safe warm tropical waters. The giants get spotted in Diani, Watamu and off Wasini island. Luckily, I was in Watamu which offers the best views for the humpback whales migration at the Malindi-Watamu Marine National Reserve. Hands down, Watamu has one of the most beautiful pristine white beaches on the coastline of Kenya. With that information before hand, I checked with Watamu tours and safaris companies to find one that offers whale watching excursions. Hemingways Watamu – the best luxury 5 star boutique beach hotel in Watamu with exquisite services and beach views – was hosting. They were offering 3 intervals of whale watching excursions per day. I booked for Saturday afternoon. Punctually, I arrived at Hemingways hotel Watamu that Saturday afternoon at 2:00 p.m. We were then teamed up with a group of both local and international tourists and were ushered to the luxurious speed boat, ready for our maritime adventure. The captain drove the speed boat several miles away to the deep sea at the humpback whales hideout where he slowed down to time their surfacing sprouts as we swooned the stunning view of the 360 degrees turquoise blue ocean. There was a loud silence which came off intentional ‘not to scare off the humpback whales’ as though respecting the whales’ sensed presence, awaiting her grand appearance; Her Majesty! Tourists eyes were filled with curiosity with their binoculars, phones and cameras set, ready to watch and capture the best shots of the flamboyant humpback whales. Out of the blue, we heard a loud huffing sound and there it was! A humpback whale swimming to the water surface to breathe. Oh.My.God! It was the most gigantic oceanic creature I’ve ever set my naked eyes on. Just standing there amazed by the flexibility of the majestic mammal diving in and out of the turquoise sea water got me frozen with chills like the statute of liberty. Amazing us with their acrobatic moves as they playfully slapped their tails on the water surface. Wow! Just wow! For the humpback whales, they casually come out to the water surface to breathe but for us it was a priceless live show! Humpback Whales are as playful as dolphins which made it so hard to get a perfect shot. Sadly, wordpress does not support video uploads. But you can view the short video I posted of the humpback whale surfacing and diving, on my Instagram post . Their impact on the water as they dived back in, left a massive water splash, almost like they could cause a tsunami if they wanted to. That’s how heavy they weigh – 30 tonnes! You could clearly tell that humpback whales are definitely a valuable tourist attraction in Watamu by the excited faces of the tourists on deck. Everyone was mesmerized, exclaiming “Wow!” “Oh look!” “There!” as the humpback whales played hard to get. I felt a thrilling feeling in me, in that, we were in the middle of the ocean and humpback whales were lurking, swimming casually under or around us until one majestically pops up out of nowhere. After spotting 2 majestic humpback whales, the trip was over and the captain sailed us back to the hotel. Honestly, that was more than enough for me. I wasn’t disappointed at all. It was a once-in-a-lifetime experience. However, a little too pricey for just an excursion without any sides – I’m talking about food ofcourse! But then again.. it’s Hemingways y’know!Regardless, the whale watching experience was out of this world. If you didn’t get a chance to watch the humpback whale migration, save it in your calendar so you get to watch it next year between July and September. Whale sharks are also expected to be seen sooner, around February or March to give you more options. Don’t miss out on this epic experience. Live a little! This entry was posted in adventure, Uncategorized and tagged adventure, babywhale, breeding, Explore, fun, Hemingways, humpbackwhalemigration, humpbackwhales, Kenya, lifestyle, seaexcursion, seafood, swimming, Travel, vacation, wanderlust, Watamuisland, Whalewatching. Bookmark the permalink. 10 Responses to Humpback Whale Watching In Watamu – Hemingways. OMG babes, loved the post!!! I can just imagine how much fun you had experiencing this!!! Please keep us updated….next year inshaAllah. Thanks hun! It was amazing and pleasure is all mine to share awareness of whale watching that I myself had no idea about until recently. I wish everyone would get to enjoy the experience of whale watching! Next year don’t miss out! Yes dear you should! Amazing experience!